Now that Charlie is two, the personality is coming out full-force. He is an independent little man who knows what he wants and is not afraid to make it known. This also means that he's figured out what his eating preferences are (and are not) and has become a much pickier eater as of late. If it were up to him, the menu would be bread and Goldfish for breakfast, lunch, and dinner. I've had to get creative in how I incorporate fruits and vegetables into his diet. Spinach smoothies are a big go-to and I always fall back on adding peas or broccoli to our mac and cheese. 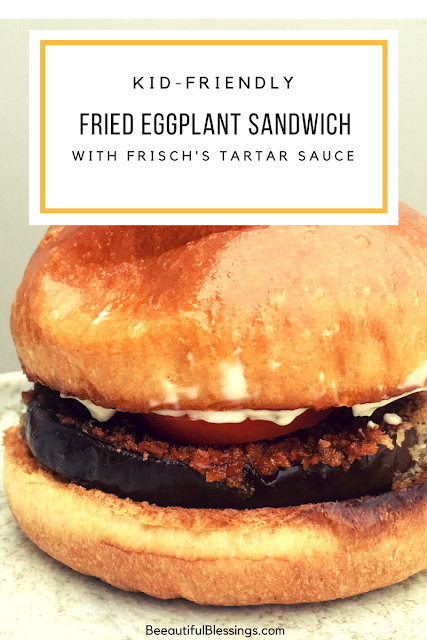 Since this kid loves chicken nuggets (sigh), I thought I would try something a little different and do a fried eggplant sandwich. I basically used the same process I would use to make Eggplant Parm, but mixed it up with a toasted brioche bun and Frisch's tartar sauce. Believe me when I say, no one is more shocked than me that Charlie actually ate it. I guess kids will eat anything as long as it's fried, crunchy, and slathered in condiments! I used an egg wash and panko crumbs for the breading and fried my eggplant slices in olive oil. Once they were dark brown and crispy, it was just a matter of toasting the bun and adding my favorite condiments- tomatoes and Frisch's tartar sauce. (Pro tip: If you make this for yourself, plan to use a ton of olive oil because the eggplant soaks it right up). This year, Frisch's Big Boy is founding National Tartar Sauce Day the Friday after Lent. The Lenten season is renowned for being chock full o' fish fries, but this tartar sauce is for way more than just fish; not least of all, the Big Boy sandwich. If you live in the greater Cincinnati area, be sure to check out Frisch's Big Boy on Facebook during Lent (March 1-April 13) for even more crazy good Tartar Sauce-inspired recipes. Disclosure: This post is sponsored by Frisch's, but all opinions, photos, and content are my own.